One hundred years ago my grandmother, Ellen Henson, had given birth to ten children, Lilian, the eldest, first having been born in 1892. Her little boy, John, died in 1911 while still a baby. Three of her remaining sons had enlisted into the army. 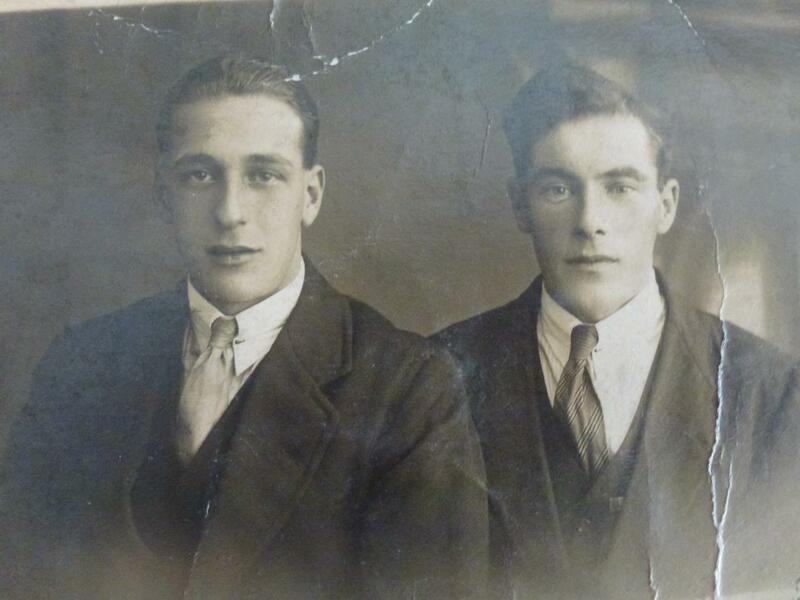 In September 1915 nineteen year old Harold had just embarked to France looking for some adventure. He had his mate, Harry Fellowes with him – two Nottingham lads in a battalion of Geordies. 12th Battalion, Northumberland Fusiliers were about to have their first taste of action having trained for a year in England. My grandmother, Ellen would know little of what happened after she waved Harold off at Nottingham station. She would not give birth to my father for another two years. On 9 September 1915 most of battalion sailed from Folkestone to Boulogne but the equipment and transport went from Southampton to Le Havre. Signallers, stretcher-bearers and Lewis gunners who included Harold and Harry Fellowes accompanied the equipment. They spent a tedious day loading mules, mule drawn vehicles and field kitchen paraphernalia onto trains. This was relatively easy at the English end as the train carriages were level with the platform. In France, however, the carriages were higher and everything was heaved up a gangway. The horses and mules, already disorientated by the channel crossing were reluctant to climb these gangways without protest. One soldier was kicked in the head and had to be taken straight to hospital with concussion and a possible broken skull. The poor lad had only just arrived on French soil and was already a casualty. It took four hours to load everything onto the train at Le Havre and despite praise from Captain Graham-Pole that they had worked splendidly, everyone was extremely fed up. Another long train journey ensued in order to meet up with the rest of the battalion at a village called Eperlecques. Harold and Harry slept well that night. Although this peaceful, old village was about twenty-five miles behind the firing line they heard the rumble of the guns but these first sounds of the war still seemed unreal. The lads’ rifles had never been fired in anger and as Captain Pole sat writing his diary in the local priest’s garden the following day, enjoying the hot sunshine, the horror, which was to come, could never have been imagined. During the two weeks the Battalion was billeted in Eperlecques the fine weather evolved into a glorious Indian summer. The captain was comfortable at the home of the priest and the ranks bedded down in a spacious, dry barn very close by. After a few days someone acquired a French phrase book and the lads tried to master a few phrases during rest periods. Large ripe grapes hung around the barn and these provided plentiful refreshment and a welcome change from tinned stew. Long route marches took up most of their days. The sun bore its heat down on them as they marched along straight, tree-lined lanes and many fell by the wayside with exhaustion. One good thing about the marches was that the field kitchens accompanied them so a decent meal was something to look forward to before the long march back to their billets. One day Harry Fellowes and Harold were amused to see a convoy of London Motor buses arriving in the village. Soon they were ordered to climb aboard and found themselves bound for Armentieres where they had been detailed to help dig trenches. The officers followed on horseback. This was the first time the lads came under enemy fire and many were excited to be close to some action at last. Shells fell close by as they were digging but there were no casualties to report as they boarded the buses to return that evening. Captain Pole, discovering his horse to be lame as he rode back, thought it kinder on the poor creature to walk and arrived many hours after the lads had eaten and fallen into an exhausted sleep. The British offensive had been planned for some time but the date of the big push kept changing, it was now set for 25 September. Little of what was being discussed at staff headquarters, many miles behind the lines, ever reached the junior officers and even less the men who would be expected to climb out of their trenches to face the enemy. The Germans, however, did know a major offensive was coming and taunted the British soldiers on the front lines by shouting from their trenches, “Why not come today, Tommy? Why wait for the 25th?”. Harold and Harry’s battalion formed part of 21st Division of the British army. It was anticipated that little more would be required of these raw recruits than a long march, pursuing a shattered and demoralised enemy. This is really interesting, Liz. I was absorbed in every word – such depth of writing and detail. I would love to know your source material, is it from private documents? A wonderful tribute to these brave men. I am looking forward to reading more. Thank you, Karen. Yes, it was from original documents. We really must have a proper chat about it some time Just published the second part here on the blog.